Photo of Barbara taken by Jay at a library tea in her honor in May 2007. 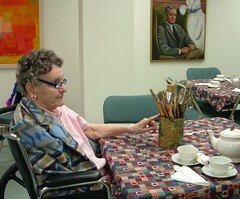 Barbara Fromm, well known Tamworth artist died on Friday, June 11. Graveside services were held at Ordination Rock Cemetery in Tamworth on Sunday, June 27th at 3:00 p.m. After the service, Barbara’s friends gathered at the library to share memories and celebrate her life both as an artist and a popular community member. For this occasion, the upstairs front room was hung with many of Barbara’s paintings and woodcuts, and other memorabilia that were given to the library by the artist in 2007. On Sunday, the library received two more portraits, one of the artist, and another of her husband. Fromm’s work will remain on display until Tuesday, July 6th. Barbara, and her husband Woody, who died in 1997, were avid and frequent library patrons. It was Barbara’s wish that, in lieu of flowers, her friends send donations to Cook Memorial Library, 93 Main Street, Tamworth, NH 03886. Gifts in Barbara’s memory will be used to support the arts at the library. ← Top 10 keyboard shortcuts you should know!